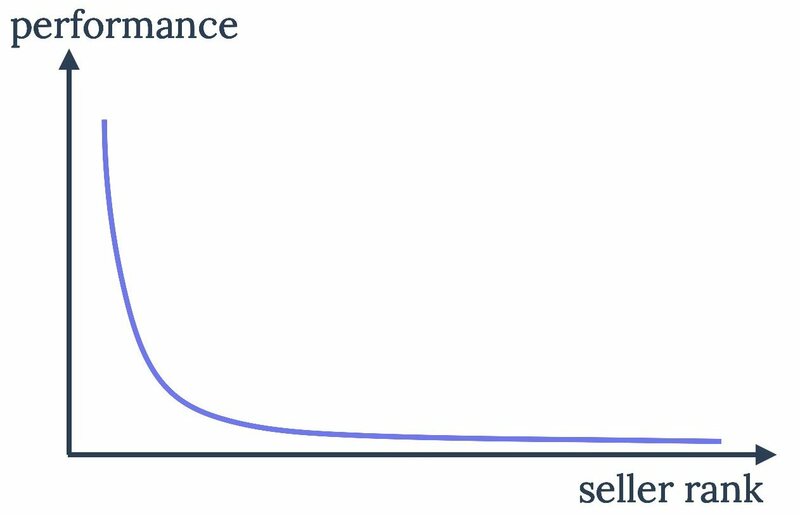 Marketplaces Power Law is the observation that a large portion of sales on a marketplace is generated by a small fraction of its sellers population. The Pareto distribution, named after the Italian civil engineer, economist, and sociologist Vilfredo Pareto, is a power-law probability distribution that is used in description of social, scientific, and many other types of observable phenomena. Originally applied to describing the distribution of wealth in a society, fitting the trend that a large portion of wealth is held by a small fraction of the population, the Pareto distribution has colloquially become known and referred to as the Pareto principle, or “80-20 rule”. This rule states that, for example, 80% of the wealth of a society is held by 20% of its population. Thus on marketplaces 80% of the sales is contributed by 20% of its sellers. Although on most marketplaces the concentration is greater than that - 80% of the sales is often contributed by less than 10% of its active sellers. According to our research power law distribution underpins all marketplaces. To calculate the curve all reviews received by each seller were summed by grouping sellers into percentiles. For example, the top 1% of Amazon sellers received 20 million reviews in a year, compared to 5 million for the next percent, and 3 million by the next. Each seller receives seller reviews from customers after a purchase. Providing feedback is optional for customers, the percentage of customers who leave a seller review is often in the range of 1-5%. However seller reviews have an upper bound, since a customer can never leave more than one per order. The shape of each distribution is slightly different which highlights different performance of the top sellers. On Etsy top sellers are not as drastically bigger than the top sellers on eBay compared to the long-tail. Amazon has less sellers than eBay, but in total they generate more GMV. On Etsy 21% of reviews went to the top 1% of sellers, 42% of reviews went to the top 1% on Amazon, and 60% did to the top 1% on eBay. But the underlying distribution is the same for all, as the Pareto principle had predicted. During Ebay’s Q4 2016 earnings call Scott Schenkel, CFO of eBay, said that “about 80% of our GMV is through B2C sellers that do over $10,000/year and the rest is 20% that’s less that.” Confirming the power law distribution. Each marketplace has millions of sellers actively selling, but power law shows that it’s the top thousands which are generating most of the sales. This is even more apparent by flipping the axis and instead looking at the percentile of performance. On Amazon.com more than 500,000 sellers received a review in a year, however 8,620 sellers accounted for 50% of all reviews received. That’s only 1.6% of sellers. Seller reviews aren’t a direct representation of the sales volume, however they allow estimating distribution well enough. They shape of the curve is the most important. And yet it’s a mistake to think of only the head of the curve, the top sellers. There’s value all along that curve. There’s money to be made up and down the power law curve. Different sellers have different expertise, capital, and access to goods. Power law is fundamental in understanding the marketplaces economy. It explains why, for example, Amazon is adding three thousand new sellers every day, and yet only 20,000 have reached $1 million in sales last year. The shape of the curve and its changes as the overall GMV grows describes a marketplace better than any other method. Understanding that marketplaces follow power laws - actually not only for the sellers distribution, but also for customers and top performing products - removes the focus on “averages” and “totals” too. They become useless. The total number of sellers and products, the average catalog size by a seller, average basket size of a customer, and the percent of sellers using FBA, are all bad metrics to follow. It’s those metrics applied to a percentile of the population or a particular niche which matter.